A tea made with Frankincense resin is an ancient and widely accepted remedy in many cultures and traditional medical systems for a broad range of ailments. 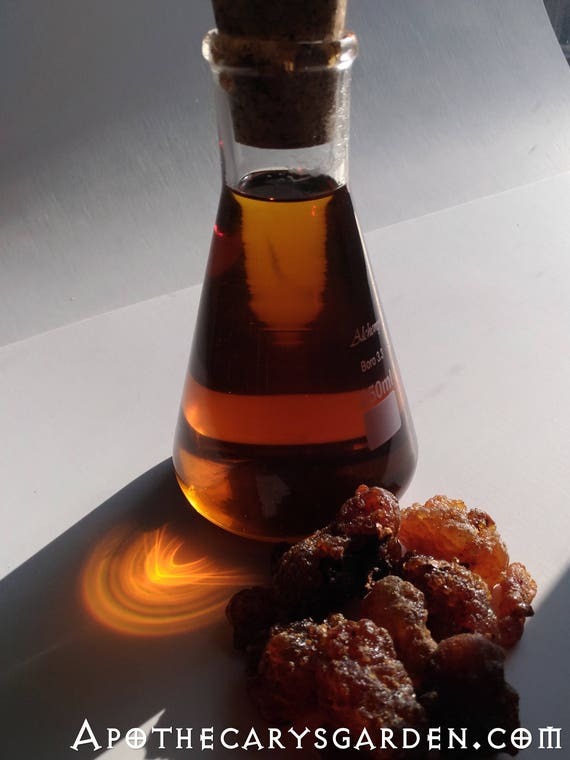 Some of these traditional uses have been researched recently to confirm or dismiss the therapeutic claims behind them, and I am surprised to see that many of the claims associated with Frankincense tea seem to be substantiated in the laboratory. I have listed a few here, but trust you to do your own research as well. Our recent obsession with Frankincense essential oil and Boswellic acids, (which are not found in the essential oil of Frankincense), can easily blind us to the plethora of therapeutic compounds found in the whole oleo gum resin and is no doubt increasing the pressure we are putting on trees that are already over-harvested and over-burdened with our market demand for Frankincense essential oil. The following gem is borrowed from a wise scientist in one of the linked studies below. I couldn’t have said it better myself. Frankincense tea is used in many cultures for widely different purposes. To increase fertility in men and women. to help with respiratory complaints such as Asthma and Bronchitis. To treat diabetes, ulcers and arthritis. 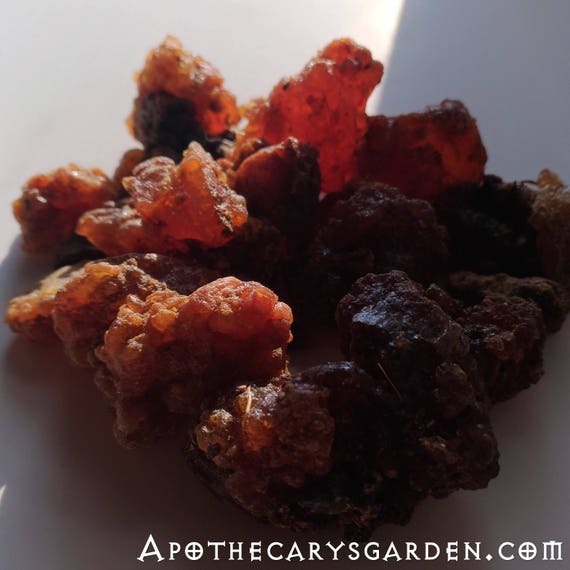 A teaspoon of Frankincense steeped overnight in water is a formula that has been around for hundreds if not thousands of years and attributed with numerous medicinal qualities. Though I found no research that enumerated all the chemical constituents delivered through an aqueous solution of Frankincense, I have no doubt that besides the obvious water soluble components one will find both essential oils and resin compounds. The traditional ratio of Frankincense granules to water is about a teaspoon crushed resin to a cup of water. 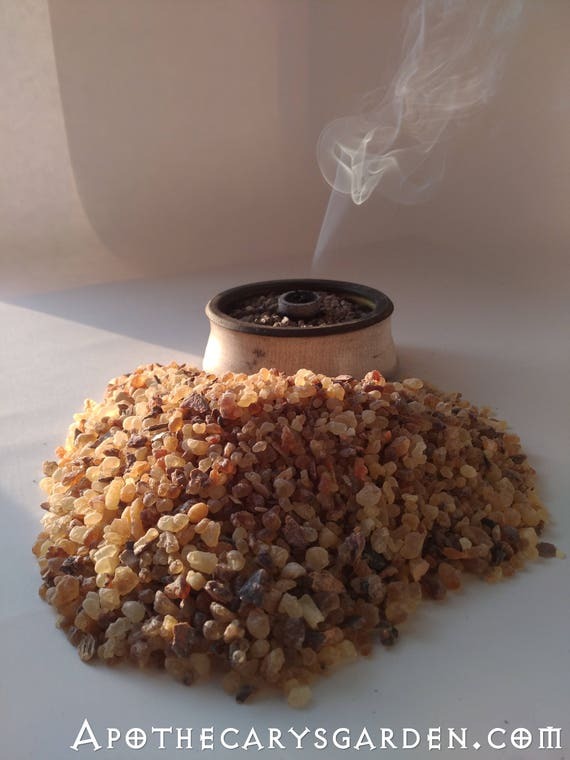 To get the most out of the Frankincense granules you could grind them to a coarse powder first.-(See the post “How to grind Frankincense and Myrrh”). Place a teaspoon of ground Frankincense in a cup, mug or bowl. Cover with a cup, (250 Milliliters), of either boiling water or cold water. Both methods are traditional and there are no studies to indicate which is best. Cover your container with a saucer or plastic wrap and let it sit overnight. Sip the tea by the spoonful throughout the next day. If you prepare too much you can keep it in the fridge for a day or two. If you want to prepare a larger amount for future use you can freeze it in ice cube trays, then store the frozen cubes in Ziploc bags in the freezer. Thaw them as needed. Remember, traditional use suggests consuming 1 cup throughout the day. It is likely more beneficial to consistently drink a cup a day than to consume large quantities over a short period. Listen to your body, and don’t overdo it. Laboratory studies of the tea, infusion or aqueous extract of Frankincense support many of the traditional uses. Below, are a few of the studies I came across. I urge you to do your own research. An online query such as “Frankincense tea” or”Frankincense infusion” won’t yield many results. However, if you phrase your search, “Aqueous solution of Boswellia”, or something similarly scientific, you will be well rewarded. I have by no means collated everything there is, and can’t judge the veracity of all the studies, but a few hours searching proved fruitful and educational. The potential benefits of a simple tea of Frankincense are extensive and yet to be fully explored. Here are a few. Studies like these remind me how much we don’t yet know about nature, our bodies and diseases. There is so much more for us all to learn. Again, I invite you to leave a comment and let me know if there is a traditional use of Frankincense, Myrrh or another oleoresin in your culture. Sharing traditional knowledge keeps it alive. I was given some frankincense resin by a friend and told about the tea. I am excited to give it a try. But I don’t own a coffee grinder… can I make the tea without grinding it? Though you do not have to grind Frankincense to a powder in order to make a tea, it helps if you are working with pieces/tears that are no bigger than peas. If you have large pieces of Frankincense, you can either break them up in a mortar and pestle or put them in a ziplock bag and give them a few firm whacks with a hammer. Smaller pieces will break down more easily in the tea and will be better absorbed in your body if you consume them after drinking the tea. Thank you for your time and all this wonderfull information, such a valuable resource. Very good info n knowledge learned for the day..
Thankyou so much for the patience to write this article for the public..
Another exceptional article. Thanks, Dan, shared!! DID YOU KNOW?! | Our favorite resin to burn as incense can and is used as internal medicine. Dan are you back in Hamilton now? Your ‘Apothecary’s Garden makes me think that all is well in your chosen field of endeavour and I’m very happy for you. Just to let you know that my dear wife Jean unfortunately has alzheimer which makes it a daily struggle for her but she is a courageous woman. Thank you John. I will call you. Greetings. I can attest to the medicinal benefits of this tea. I have been using it for approximately six months and I can honestly say that my libido has been enhanced, and my overall mood is one of contentment. I com only speak for myself, but I will continue to use this daily as long as I don’t notice any negative side effects. Peace!